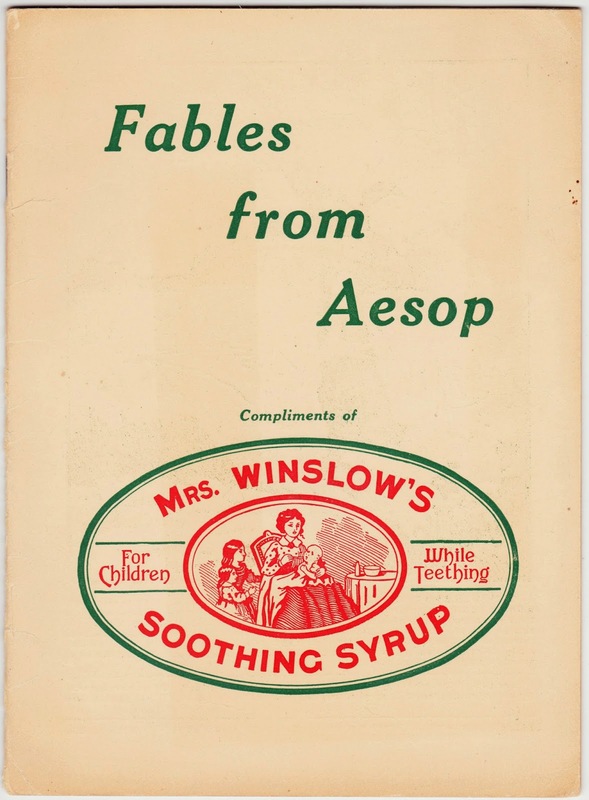 Around 1915 (exact publication date not known), the makers of Mrs. Winslow's Soothing Syrup published a booklet, which also served as a promotional device, titled Fables from Aesop. 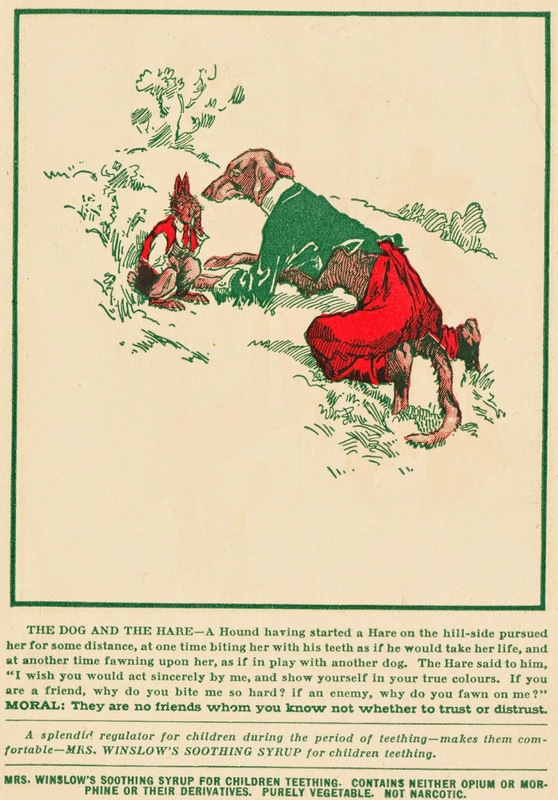 The 12-page, staplebound booklet contains 10 illustrated fables. 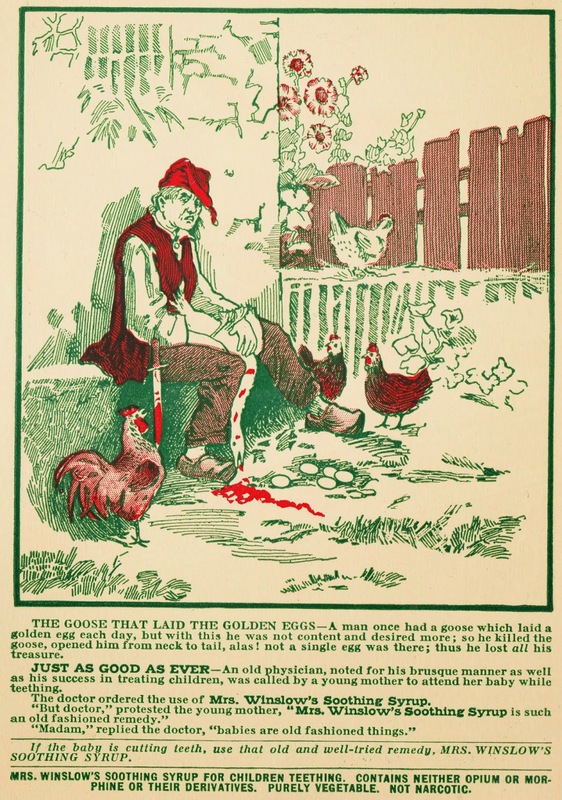 Each page also contains promotional blurbs and testimonials for the Soothing Syrup, which was designed for teething children. On the bottom of every interior page is the following statement, in capital letters: "MRS. WINSLOW'S SOOTHING SYRUP FOR CHILDREN TEETHING. CONTAINS NEITHER OPIUM OR MORPHINE OR THEIR DERIVATIVES. PURELY VEGETABLE. NOT NARCOTIC." 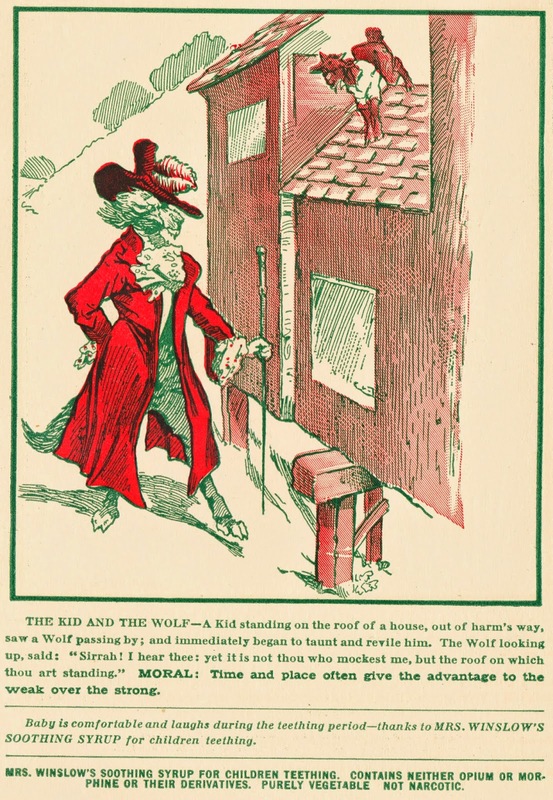 There was a good reason for Mrs. Winslow's to openly declare that there was no morphine in the soothing syrup: At one point, there had been morphine, as a primary ingredient. The product, created by a Mrs. Charlotte N. Winslow in the 1840s, originally consisted of morphine sulphate, sodium carbonate, spirits foeniculi, and aqua ammonia, according to Wikipedia. As early as 1860, according to The Quack Doctor, the American Medical Times noted grimly that parents were “relieved of all further care of their infants” through the use of Mrs. Winslow's product. 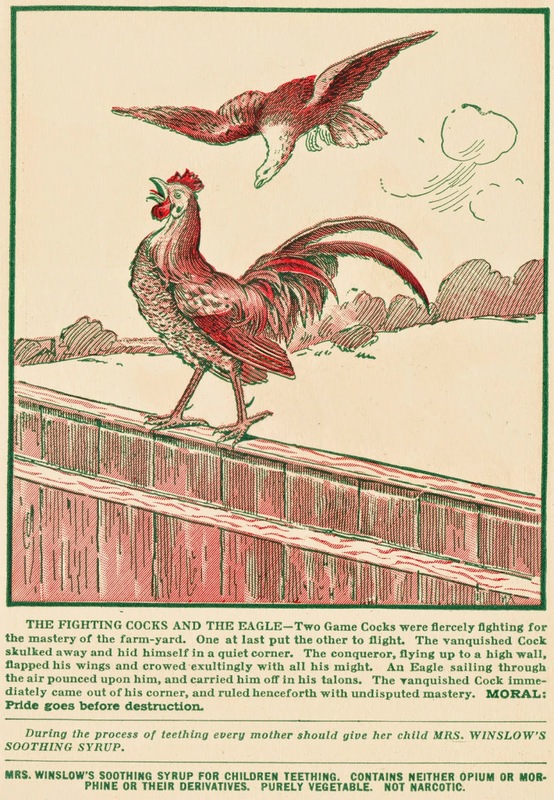 In 1911, the American Medical Association flatly labeled Mrs. Winslow's Soothing Syrup as a “Baby Killer" — but even that apparently didn't speed the product's exit from the market. In fact, the third volume of An Annotated Catalogue of the Edward C. Atwater Collection of American Popular Medicine and Health Reform states that "as late as 1915 ... the mixture contained five per cent alcohol and one-tenth of a grain of morphine sulphate per fluid ounce." So, clearly, we should be happy for the regulation of pharmaceuticals that exists in the modern United States.